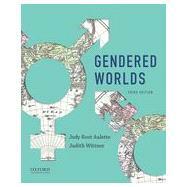 Judy Root Aulette is Professor in the Department of Sociology and the Women's and Gender Studies Program at UNC-Charlotte. She is author of Changing American Families, Third Edition (2010), and coauthor, with Anna Aulette-Root and Floretta Boonzaier, of South African Women Living with HIV: Global Lessons from Local Voices (2013). Judith Wittner is Professor in the Department of Sociology at Loyola University Chicago. She is coeditor, with R. Stephen Warner, of Gatherings In Diaspora: Religious Communities and the New Immigration (1998). The Basis of Sexuality Is Not "Either-Or" but "Both-And"
What Difference Does Differential Treatment in Schools Make? Who Is In the Paid Workplace? Why Is There a Wage Gap between Women and Men? How Can the Gender Gap in Promotion Be Closed? Why Is Women's Work Invisible? What's Behind the Way People Divide Up Housework? Why the Hostility against Women in the Military? Why Are Differences in the Treatment of Women in the Military Important? What Difference Would More Gender-Equal Religions Make?